This is the second year the Harlequin Heartwarming authors have put out a collection of connected stories in a holiday collection. 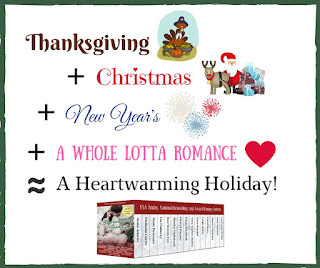 After a couple of years writing holiday romances for box sets - Christmas holiday romances - I was happy to be part of a project where the "holiday" encompassed Thanksgiving, Christmas, and New Year's. This is the third year I've written connected holiday romances with Anna Adams and Anna J. Stewart. Since all the novellas are set in Christmas Town, Maine, and the first two sets we worked on were connected stories about siblings already living in town, we decided to reunite college roommates who come to start a new business. What starts out as a remodel and redesign business turns into a holiday decoration business for the season. My story occurs between Christmas and New Year's Day. Gavin is in charge of creating a light display and ice castle with a slide for the kids for a local ski resort. At the same time, he's agreed to dog-sit his friend's St. Bernard. Snowflake is used to warmer weather than Maine. He doesn't like working outside with Gavin. Through a series of dog-driven events, Snowflake ends up with a second dog-sitter - veterinarian Amelia (or Dr. Scrooge as she's known locally). While Gavin makes his living on emphasizing the holiday spirit, Amelia has been doing everything to avoid the holiday (and thinks she's safe for another 51 weeks). Little does this couple know that Snowflake is a master matchmaker! Do you have a favorite holiday among Halloween, Thanksgiving, and New Year's? Melinda Curtis is an award-winning USA Today Bestseller. Her latest release is A Heartwarming Holiday, which is priced at 99 cents and includes a $1 off coupon for your next Harlequin Heartwarming purchase! Pre-order your copy today! Sounds like a great read and wonderful set, Mel. Thanks for sharing!